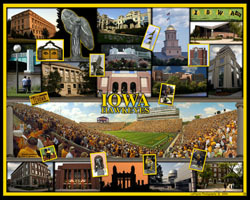 Iowa Campus Composite - #122. Kinnick Triple with Cheerleaders - #124. Kinnick Stadium Then and Now - #123. Iowa Triple Composite - #93. Iowa Triple 2010 - #95. Iowa Triple 2010 - #96. Kinnick Stadium, Iowa City 2010 - #97. Kinnick Stadium Then and Now.